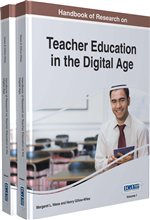 The digital age requires teacher education programs to constantly evaluate and revise their programs and courses, particularly with reference to guiding teacher candidates towards integrating current and emerging technologies. This designed-based research study demonstrates how state-wide mandates to revise teacher education programs were used in promoting subsequent revisions influencing the course components and teacher candidates' development of Technological Pedagogical Content Knowledge (TPACK). Cases of four undergraduate elementary education courses and the advanced licensure elementary education program are described. The cross case analysis reveals the subsequent influence on the program for improving the TPACK preparation of the teacher candidates. The chapter concludes with implications for teacher educators and leaders of teacher education programs. Technological advances are having a significant impact on multiple facets of people’s lives, including ways they communicate, learn, and work (Allen & Seaman, 2013). Education is not immune to such influences and as a result, changes in delivery options now provide the means to address learners’ demands for “more flexible access to content and instruction at any time, from any place” (Means, Toyama, Murphy, & Baki, 2013, p. 3). The amount of technology access in Pre-Kindergarten through Grade 12 (PK-12) schools is at an all-time high (New Media Consortium, 2014). Still, access does not always result in effective technology use or student learning (New Media Consortium, 2014; U.S. Department of Education [USDE], 2010; Vega, 2013). The recommendations in the National Educational Technology Plan as well as the International Society for Technology in Education (ISTE) National Educational Technology Standards for students (ISTE, 2007) and teachers (ISTE, 2008) call for K-12 students to use technology to access and synthesize information, communicate with others around the world, create representations of knowledge and learning products, and facilitate their own learning of content and information. While these recommendations have potential to support teaching and learning processes, research indicates that teachers either do not integrate technology at all or choose not to integrate technology in meaningful ways in their classroom (Ertmer & Ottenbreit-Leftwich, 2010; Ertmer, Ottenbreit-Leftwich, Sadik, Sendurur, & Sendurur, 2012; Polly & Hannafin, 2011). These studies cite the need for teachers to receive high quality learning experiences (Lawless & Pellegrino, 2007; Polly & Hannafin, 2011) as well as experiences that will support teachers in ongoing ways to address negative beliefs related to teaching with technology (Ertmer & Ottenbreit-Leftwich, 2010; Ertmer et al., 2011). In light of the potential benefits of teaching with technology and the barriers that teachers demonstrate, teacher education programs must play a vital role in preparing future teachers (teacher candidates hereafter) with the knowledge and skills related to integrating technology into classrooms (Council for the Accreditation of Educator Preparation [CAEP], 2013; U. S. Department of Education [USDE], 2010). Design-Based Research: A research paradigm that involves a cyclical process of identifying a problem or question, testing an intervention, collecting data, analyzing data, and refining the intervention. Teacher Candidate: Individual in a teacher education program. Clinical Experiences: Experiences in a teacher education program in a school setting. Technological Pedagogical Content Knowledge (TPACK): Construct that suggests that teachers need knowledge of technology, pedagogy, and content and the intersection of those aspects of knowledge in order to effectively integrate technology into their teaching. Teacher Education: Programs responsible for preparing teacher candidates for teaching careers and provides continuing education for practicing teachers. Science Education: Topics related to the teaching and learning of Science content. Initial Licensure Program: A teacher education program that prepares individuals to start their teaching career. Social Studies Education: Topics related to the teaching and learning of Social Studies content. Elementary Education: Topics related to teaching students in grades kindergarten through grade six.